The non-reconstructed human body inscribed in early-Christianity was considered as an untouchable God’s creation, so was strictly forbidden its reconstruction. Then, the social and religious order has progressively allowed the reconstruction to the condition this latter was inscribed within the following dichotomy, between normal and pathological. Thenceforth practice of plastic surgery has developed in performing increasingly good reconstructions (connected to the progresses made in Medicine) up to start considering the plastic enhancement of the human body. How can we make a better body, to go beyond the human functions and aesthetics, in regard with the use of techniques and technologies. 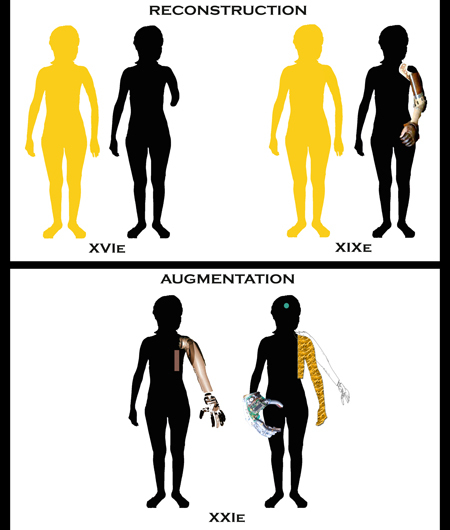 This work with a left-arm amputee has underlined the visual comprehension of the lack of a limb, for amputees, and the evolution of the undertaken surgery (aesthetical and functional) from the attempts of reconstruction (prosthesis in wood) to its plastic augmentation (bionic prosthesis or brain-machine interface).